Beijing:A Chinese lunar rover landed on the far side of the moon on Thursday, becoming the world’s first spacecraft to touch down on the moon’s uncharted side never visible from Earth, in a major boost to Beijing’s quest to become a space superpower. The probe was launched by a Long March-3B carrier rocket on December 8 from the Xichang Satellite Launch Centre in Sichuan Province. It landed on the Von Karman crater in the South Pole-Aitken basin and then sent back a picture of the landing site shot by one of the monitor cameras on the probe’s lander, marking the world’s first image taken on the moon’s far side. The successful landing formally inaugurated the world’s first expedition to the far side that never faces the Earth and is expected to fulfill scientists’ long-held aspiration to closely observe the enormous region, state-run China Daily reported. Tidal forces on Earth slow the moon’s rotation to the point where the same side always faces Earth. The other side, most of which is never visible from Earth, is the far side of the moon. Though the far side has been extensively photographed by spacecraft, starting with a Soviet probe in 1959, no probe had ever made a soft landing onto it. So scientists around the world had not been able to conduct close observations and surveys of the region for decades. 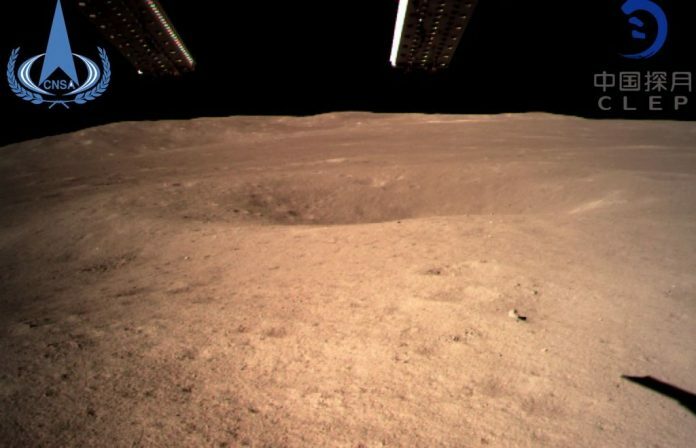 Direct communication with the far side of the moon, however, is not possible, which is one of the many challenges for the Chang’e-4 lunar probe mission. China launched a relay satellite, named Queqiao, in May, to set up a communication link between the Earth and Chang’e-4 lunar probe. This is the first time an attempt is made to explore the far side of the moon. Since the moon’s revolution cycle is the same as its rotation cycle, the same side always faces Earth. The other face, most of which cannot be seen from Earth, is called the far side or “dark side” of the moon, not because it is dark, but because most of it is uncharted. The Chang’e-4 mission will be a key step in revealing the moon’s mysterious side, a report by state-run Xinhua news agency said. The scientific tasks of the Chang’e-4 mission include low-frequency radio astronomical observation, surveying the terrain and landforms, detecting the mineral composition and shallow lunar surface structure, and measuring the neutron radiation and neutral atoms to study the environment on the far side of the moon, according to CNSA. Chang’e-4 mission has four scientific payloads developed by scientists from the Netherlands, Germany, Sweden and Saudi Arabia. Chang’e 4 is the fourth lunar probe launched by China since the country’s lunar programme was opened in 2004. Named after the goddess of the moon in Chinese legends, the first Chang’e spacecraft was launched in 2007 to verify China’s lunar probe technology, obtain lunar images and perform scientific surveys. The Chang’e 2 followed in 2010 to carry out high-definition imaging of the moon and investigate landing conditions for the Chang’e 3. Chang’e 3 landed on the moon in 2013. Chang’e 3 released the first Chinese lunar rover, Yutu, on the moon. It worked there for around 1,000 days.